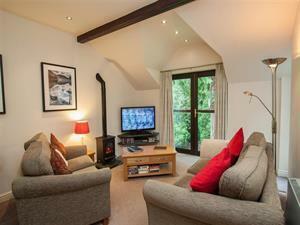 Fir Howe Self-cateringA very attractive first floor apartment for two, set in a picturesque woodland just above Skelwith Bridge in the Neaum Crag estate. Situated at the entrance to the Langdale Valley, the central location gives easy access to Ambleside, Coniston and Grasmere. Fir Howe has just been completely refurbished and well insulated, providing stylish, comfortable accommodation at any time of the year. Ideal for a couple looking for a cosy retreat, whilst having the benefit of some of the finest walks in the Lakes on your doorstep, and a pub and a cafe just a short walk down the hill. Accommodation: A short flight of outside steps lead to the front door at first floor level. Entrance hall with space to leave coats and boots. Open plan lounge/dining room/kitchen. The lounge has two sofas, a 43 inch flat screen plasma TV with freesat channels, DVD player, electric flame-effect stove and iPod dock/DAB radio/CD player and free Wi-Fi. There is also a door leading onto the balcony where a view of the Langdale fells and the immediate woodland setting can be enjoyed. The kitchen has quality appliances and local slate worktops. The bedroom has a king-size bed, and a patio door leading on to the balcony. The en-suite bathroom contains a wc, basin, bath and separate corner power shower. The property is very attractively furnished with tasteful, coordinating soft furnishings that create a relaxing holiday feel. Fitted carpets and Karndean flooring throughout, with electric heating and double glazing. Outside: Balcony with table and chairs, a relaxing space to enjoy the surrounding countryside and small tarn immediately outside the property and with a good view of the Langdale fells in the distance. Private parking for one car. Cafe and pub at Skelwith Bridge a short walk down the hill, nearest shop at Chapel stile or Ambleside approx two and a half miles. Note: Sorry no room for cot or high chair (not suitable for children). A very attractive first floor apartment for two, set in a picturesque woodland just above Skelwith Bridge in the Neaum Crag estate. Fir Howe offers weekly bookings starting on Friday.